Comb Jellies are any of the species of jellyfish belonging to the taxonomic Phylum Ctenophora. Also known as sea gooseberries, sea walnuts, or Venus' girdles, they are predators that are known for consuming large quantities of food. Unlike cnidarians, with which they share several superficial similarities, they lack stinging cells. Instead, in order to capture prey, ctenophores possess sticky cells called colloblasts. Ctenophora are almost completely radially symmetric and normally completely colorless, although there are some exceptions to this. They are normally only a few centimeters long and live with algae cells. The body is made up of two clear cell layers, which make up its outer skin, or ectoderm, and its inner skin, or gastroderm. The outer layer is two layers thick and is coated in a protective slime that has been discharged from the body through special glands. The inner layer surrounds a pocket in the Ctenophora which is used as the stomach of this organism. The food is caught with the tentacles and drawn up into the stomach. The food is pre-digested with very strong enzymes in a long, narrow channel that connects the stomach to the opening, which it first passes through. It then passes into the stomach where it is completely broken down into nutrients for the organism to use. If there is any waste that cannot be digested, then it is emitted from the body through the mouth of the Ctenophora. The space in between the two layers of skin is made of a thick, transparent, jelly-like substance which is known as the mesogloea. The mesogloea is made up of extracellular proteins which form a very strong bonding agent. The way that the Ctenophora usually move is by drifting with the current, although, they can swim if the need ever arises. The way that they can do that is by spinning their tentacles and using them as a prop. Then they open their mouths and use the opening as a rudder. This is just another example of how creative our God is. Almost all Ctenophores reproduce sexually except for the organisms in the order Platyctenida, which reproduce asexually. Most of the Ctenophora are hermaphroditic, which means that they contain both female and male reproductive organs. These organs lie near the small channels of the mesogloea directly under the 'combs'. Organisms in this phylum emit their gametes into the water through small openings in the ectoderm, these openings are also known as gonopores, where fertilization takes place. Common with most of the species, the gametes will not emit until they are triggered by the perfect outside lighting conditions. One species (Tjalfiella tristoma) is viviparous which means that the newly fertilized eggs develop until birthed live. Ctenophores are fairly simple animals that live only in marine waters; they can be found in most marine habitats, from polar to tropical, inshore to offshore, and from near the surface to the very deep ocean. 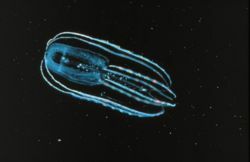 Ctenophores in the Order Cydippida use a pair of sticky tentacles that can be retracted into tentacle slots in the body near the pharynx to trap copepods, larval fish, eggs, and other small zooplankton. Cydippid bodies are normally spherical or in the shape of a pear. the ones that are in the Order Lobata make use of large oral lobes, ciliated ribbon-like projections, and mucus to harvest similar prey. 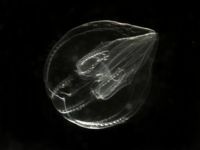 Lobate comb jellies normally have flat oval-shaped bodies when compared to other species. The tentacles are there but are greatly reduced in size compared to cydippids. Their close relatives in the Order Cestida have a ribbon-like body, flattened in the tentacular plane and greatly elongated in the pharyngeal plane.